Go to any caravan park or drop into any online forum and ask people what they think is the best heavy-duty tow vehicle. Plenty will tell you it’s the Toyota LandCruiser 200 Series. The Cruiser may be bulky, expensive and lacking in features to some but, to most who have bought one, it’s hard to argue with the way you can put 3.5t on the ball and just get on with it. The Cruiser has remained unchallenged as the prime tow hauler by any other volume brand for a long time. Meanwhile, with no direct replacement scheduled, the Y61 Patrol has struggled along in its tired old clothes effectively unchanged since its 1998 release (except for a ‘new’ 3L engine 10 years ago). The last time the Y61 Patrol was competitive with Toyota’s top-end wagon was with the 1998-2007 LandCruiser 100 Series. Some critics will say it was actually only competitive with the 80 Series before it, when both shared a 2500kg maximum towing capacity. 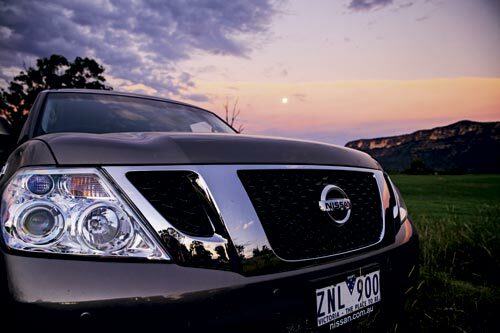 But, finally, Nissan has a vehicle to compare with the 200 Series, the new Y62 Patrol V8. The Y62’s arrival doesn’t mean the old Y61 can be pensioned off; it will continue with its basic appeal – until it just doesn’t appeal anymore or until it can’t pass emissions or safety laws. 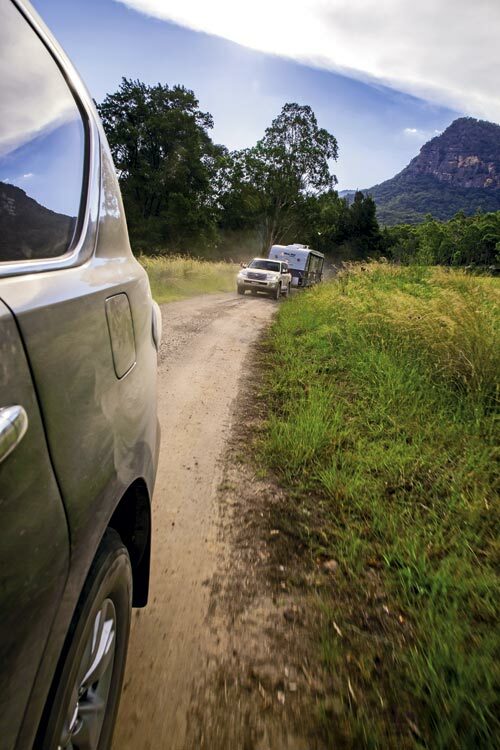 Like the LandCruiser, the Patrol V8 is no bare-bones family truck. Back in the day, these wagons were bought by families on average incomes; now they are luxury items. If you’re spending your hard-earned on a big, expensive tow vehicle, you would expect more thrills than the average carnival ride. So, as expected, these two vehicles have a load of gear in them for the not insubstantial amount of cash involved. 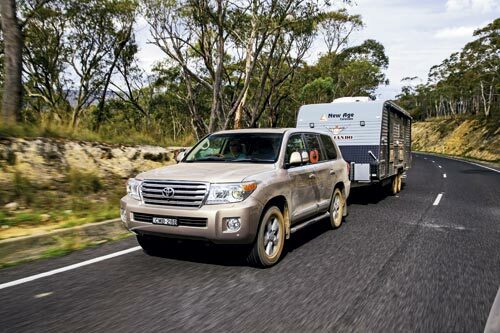 The LandCruiser is the top model in the four-tier range and, if you are happy with vinyl flooring and basic equipment levels, the LandCruiser GX is available for $78,990. 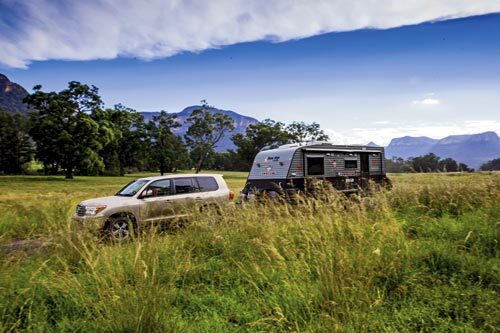 However, the Sahara TDV8 we tested, the best LandCruiser money can buy, is $119,900. The Patrol we had on test was not the one we originally asked for (see right); we had been promised a top-spec $113,900 Ti-L but instead got the mid-range $92,850 Ti. With these top-spec luxury models, it is interesting to see what luxury gear each manufacturer makes an effort to include and what is missing. If you compare specs between equivalent models, the Ti-L with Sahara, there is plenty in common. Both have a leather interior, power front seats and steering column adjustment (with memory for driver’s seat and the steering column), climate control (four-zone in the Sahara; three-zone in the Ti-L), centre console cool box, power-operated tailgate, auto-on Xenon headlights, rain-sensing wipers, electric folding, heated chrome side mirrors (anti-dazzle on Sahara), satnav, premium audio systems, glass tilt/slide sunroof, hill descent control and hill-start assist, parking sensors and around-view cameras, anti-dazzle interior mirror, rear entertainment with headphones (one screen in Sahara; two in Ti-L) and three-row seating (eight occupants in Sahara; seven in Ti-L). The Sahara has a woodgrain-look gear lever and steering wheel that the Ti-L misses out on, while the heated/cooled front seats are Ti-L-only features. If we had the Ti-L, we would have also been able to point to its superior technology features over the Sahara. 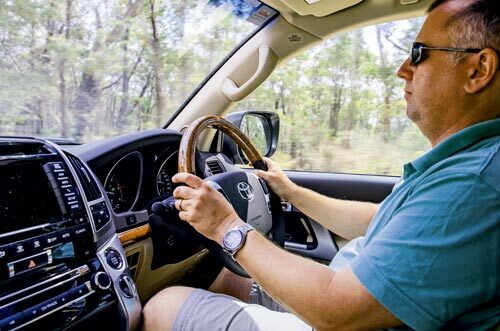 The LandCruiser might be a good truck, but it has been around for six years now, and there have been a lot of developments that it has missed out on. Features like Intelligent Cruise Control, Forward Collision Warning, Distance Control Assist, Lane Departure Warning and Prevention, and Blind Spot Warning and Prevention, which are all included in the Ti-L.
A safety feature included in Sahara since the 2013 model year but not available on Patrol is trailer-sway control. Each of these vehicles has huge interiors – you would be hard-pressed to call either of them cramped, especially in the first and second rows. Both require a climb up to get aboard, and inside each provides a load of leather and fake wood. Although the beige Sahara interior felt much brighter and more modern for it, the wood-look accents were a bit over the top and it would be easy to mark the leather. The dark grey and black Ti interior might look a bit plainer to some, but it also felt a bit more like discreet luxury, especially with the dark, faux-wood accents and thick piping on the big leather seats. The main instruments in both vehicles take a different approach. The Sahara’s Optitron back-lit gauges almost look like an LCD readout (but they’re not), while the traditional, silver watch-dial look of the main Ti gauges flanking an LCD readout are very clear and classy. 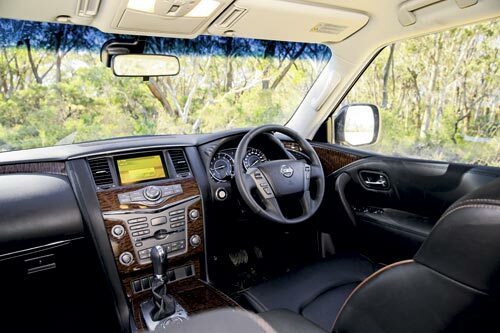 The rest of the control and instruments are pretty good for both vehicles, but the Patrol’s left-hand drive configured gear lever (over to the left of the wide console) and small, fiddly buttons on the centre stack are behind the LandCruiser’s simple, centrally-positioned gear lever and large buttons with big icons or names on them. The Cruiser’s satnav/central info screen is clearer and bigger than the Patrol’s, too. Setting up the Bluetooth in both vehicles marked a contrast in how technology is treated. The Patrol has a voice command/recognition system to take you through pairing your phone. It is slow and suddenly cancels the operation if the vehicle begins moving, leaving you to start the whole process again the next time you stop. The Sahara’s Bluetooth pairing is much easier. Both these vehicles have good forward and side vision, though the Patrol’s bonnet seems longer and doesn’t taper off like the LandCruiser’s, which gives the Toyota slightly better vision when parking or on tracks. Each of these big boys benefits from a brace of parking cameras and sensors – they can seem quite cumbersome when looking for appropriate lodgings in a carpark. The Patrol’s centre mid-row seat headrest blocks rear vision and seems a cost-saving way of doing things when compared to the Sahara’s neat recess for its centre headrest. The Patrol’s front seats offer a little more side support than the Cruiser’s, but both offer comfy pews for the long haul. 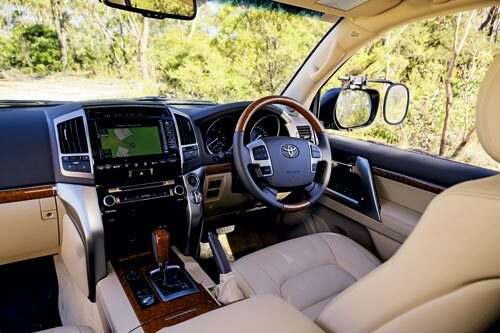 The LandCruiser and Patrol both have enormous second-row seat space, with the Patrol giving occupants slightly more room and comfort. Third rows are really intended for juniors, but the LandCruiser offers a better-shaped pew, and has integral seatbelts compared to the ceiling-mounted belt for the Ti’s centre occupant (which the Ti-L, if we tested it, wouldn’t have as it has only seven-occupant capacity). 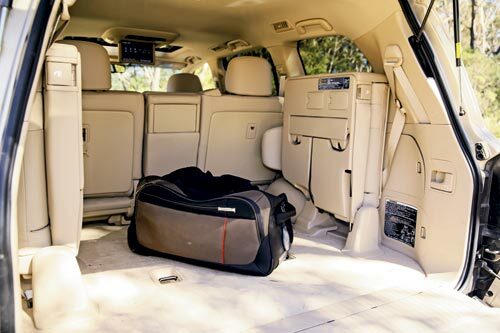 Even though the third-row seats fold forward in the Patrol against the more awkward, old-school side-folding seats in the LandCruiser, at least the LandCruiser presents a flat load floor. The Patrol’s third row won’t fold flat, and leaves a gap between it and the second row for stuff to fall through. 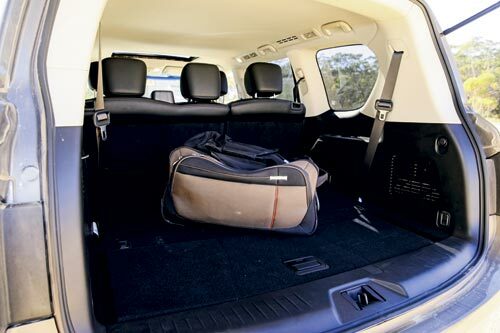 The LandCruiser also scores great second-row auto-fold handles on the cargo side walls close to the vertical split rear tailgate – itself a great feature, offering a picnic table or impromptu seating while stopped. Even though both trucks have V8 engines, how they are fed, what they are fed and how they output their power and torque are very different. The Patrol’s 5.6L petrol V8 doesn’t rely on any significantly new or exciting technology; direct injection is up there among the hi-tech offering of the moment But this is no small displacement, small bi-turbochargers type of engine, nor does it offer cylinder deactivation. Some ‘new’ technology happens further south – the seven-speed transmission is quite a new development for SUV wagons at this level, although the Patrol is not the first to offer it and it’s questionable if it actually makes much use of it for economy or performance. The Toyota’s V8 is the company’s first diesel with this configuration and in the 200 Series has two turbochargers to help fill cylinders in its relatively small displacement V8. Like most contemporary diesels, the LandCruiser’s has direct common-rail injection. The Patrol fires up to a smooth idle and purrs its way around town like a big, well-fed cat. Poke it in the belly on the open road and the V8 shifts the big Patrol along as if it had just jettisoned several hundred kilos of cargo. It feels very responsive and quick, and the V8 sounds fantastic when working hard. The transmission is smooth but the ratios seem to bunch up at the top end; the ratio spread is, if anything, a bit distant in the lower gears, so when you kick down at rolling speed the Patrol doesn’t pull out of the scrum and charge for goal as purposefully as you’d think. Give it a few ratios to sort itself out, though, and it fairly barrels along. The Cruiser’s engine, by contrast, fires up and settles into a big-diesel thrum. With the characteristic compression ignition rattle happening in so many cylinders, it’s a bit like expecting a pack-a-day smoker not to cough. In short, the Cruiser sounds like a beefy truck when idling or trundling around, and you don’t so much feel the vibrations as hear them. But trundling along is what the Cruiser V8 does so well. 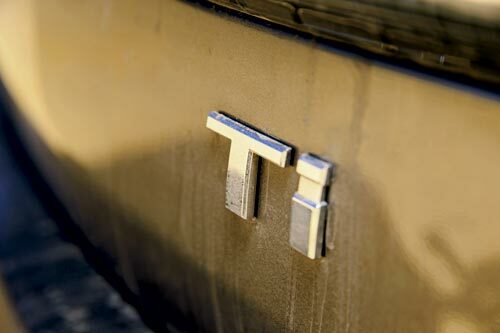 There is no need to do much, just give the throttle a gentle squeeze and wait for the turbos to kick in, and then enjoy the big, lazy wash of torque as it laps over you. The transmission is no shining jewel in the world of self-shifters, but with this engine it hardly needs to be. Still, quite a smooth operator and better since Toyota fiddled with the software, allowing it to hit top gear by 100km/h (instead of at 120km/h, as the first 200 TDV8s did). If you line up this pair in a drag race contest, the Patrol would win every time. Although the LandCruiser is lighter (but only by about the weight of a jockey), the Patrol gallops ahead as its engine sings to the 6250rpm redline. Yet in your typical 100km/h-110km/h cruising situation, the LandCruiser seems to stick in top gear more than the Patrol when it hits a hill. The Cruiser has more torque, and here you feel it. Both the Patrol and LandCruiser use fancy suspension systems to help them do seemingly contradictory things; let the suspension be stiff like a sports car around corners so that the big wagons don’t fall over, yet lush and loose when you want the wheels to compress and droop as much possible without leaving the ground when offroad. The Cruiser’s party trick is contained mostly in its sway bars, which have hydraulic rams that stiffen or loosen the sway bars as required. The Patrol’s smarts come down primarily to the shock absorbers, which are linked across the vehicle to reduce body roll when cornering or, conversely, allow more compression/droop when offroad. Land Rover has used a similar principle with its air spring suspension, not linking shocks but air springs across the body. Both of these vehicles make pretty good open road tourers and, as you’d expect, make a meal out of things if you approach tight corners with too much gusto; these near-3000kg vehicles don’t change direction in a rush. The Sahara has the better ride of the two vehicles and, while the Patrol does feel quite nimble and changes direction more quickly than the Sahara, its ride is not quite as good. On our set-piece offroad climb, the Patrol did it with a little less fuss than the LandCruiser. Perhaps the drivers picked a slightly different line, but the Nissan’s locked rear diff will stop wheel slip more quickly than the Toyota’s traction control in this situation. The LandCruiser slipped down to around 12.5L/100km driving mostly on the open road with a bit of urban driving thrown in, while the Patrol managed to get down to 14L/100km in the same conditions. With a bit of offroading thrown into the mix, the LandCruiser’s consumption rose to 15L/100km, while on the same loop the Patrol sat on 20L/100km. 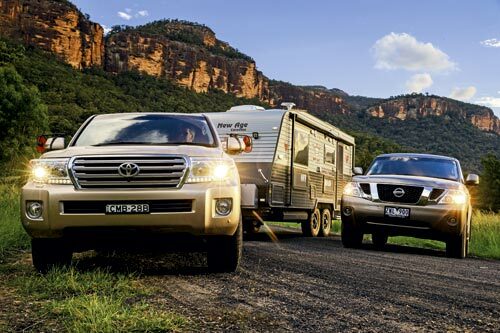 While towing a 3000kg offroad, full-height caravan, the LandCruiser consumed 19.2L/100km and the Patrol consumed 32.2L/100km towing the same van. On paper, you could make some predictions about these vehicles as tow tugs. Both are heavy – useful for keeping things under control when something heavy behind gets wobbly and tries to upset the tow vehicle – and both have lanky wheelbases without too much rear overhang, again a plus for stability. The Patrol has both a longer wheelbase and is (slightly) heavier, so it was going to be interesting to see which vehicle was better on the road. With no weight distribution hitch fitted to either vehicle, we were able to assess how their respective chassis coped with the van behind. The LandCruiser sat high in the back unladen, and with the 140kg ball weight, continued to sit level. It did feel the weight shift around behind it on undulating roads, but settled relatively quickly. In contrast, the Patrol was yawing and pitching at anything much beyond 80km/h; not dangerously so, but it wasn’t exactly comfortable. By 100km/h on a secondary road, it felt like it was time to slow down. Although the Patrol has better outright hill-climbing performance – hitting 60km/h up our steep test hill versus 50km/h for the LandCruiser – the Patrol felt as though it was working its engine hard a lot of the time – and shifting gears a lot to be in the powerband too – whereas the Cruiser had to occasionally dig deep but was generally happy to poke along at 2000-3000rpm, usually in the same gear for a while. Engine braking was better in the LandCruiser, but the Patrol wasn’t as bad as we were expecting from a free-revving petrol engine. 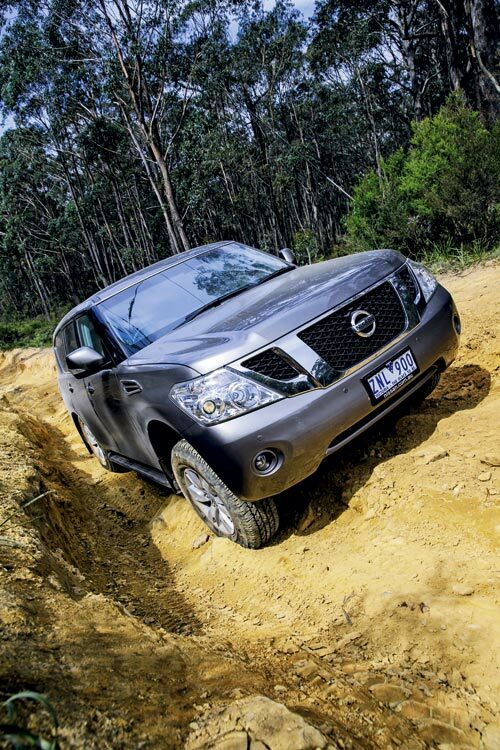 When we booked the V8 Patrol for this test, we decided to test either the entry level or top of the range. Nissan was keen to give us the range-topping Ti-L, and Toyota had a new 2013 Sahara just on fleet, so it seemed a done deal. Then trouble struck. At the 11th hour, Nissan had delays with its factory towbar. The first production towbar was ready to bolt on, but the accessory had not been signed off in Japan. Seeing as it would be Nissan Japan carrying the can if the towbar was faulty, they, of course, wanted to authorise any such accessory carrying the corporate name. There was also confusion on their end about which press vehicle was being fitted with the towbar. So it ended up on the mid-range Ti, and we all only realised the error when it was picked up and we were on our way out of town to begin testing. Thankfully the Ti and Ti-L are mechanically identical and share the same suspension and wheel and tyre package. Weight difference is minimal; the Ti weighs just 29kg less than the Ti-L. The main differences are with the features: the heated/cooled front seats, Intelligent Cruise Control, Forward Collision Warning, Distance Control Assist, Lane Departure Warning and Prevention, and Blind Spot Warning and Prevention are key features missing on the Ti. The Ti does get one extra seat; it carries eight occupants versus the seven in the Ti-L. It is great to finally see a fresh Patrol flow onto the market after years of stagnation. 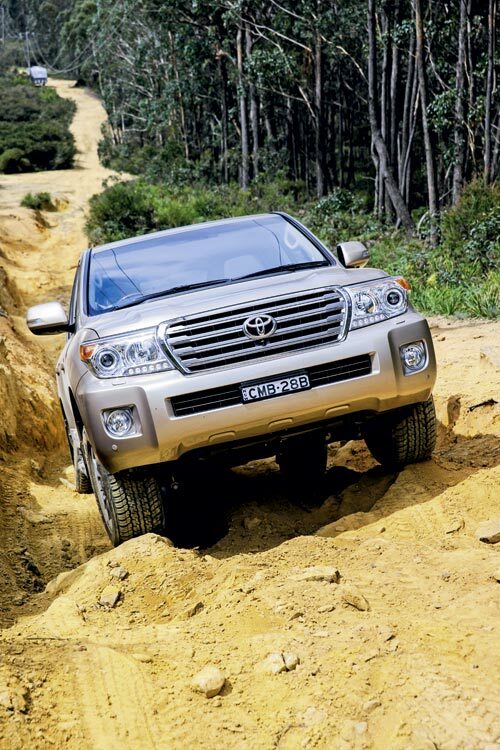 The Y62 Patrol has a smooth, free-revving V8 engine and clever suspension that allows the seemingly contradictory on-road and offroad abilities from the same package, while the Ti-L’s standard advanced driver technology is to be applauded. 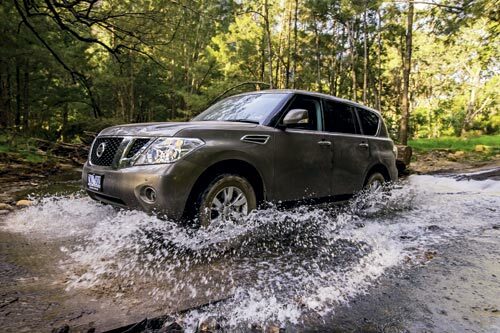 Yet while it has had all these years to develop well ahead of the LandCruiser, it feels as if Nissan either didn’t have, or didn’t want to spend, the money to develop the Patrol to its fullest potential. Interior packaging is compromised, the suspension doesn’t appear to be completely developed for towing and the V8, while acceptably thrifty when cruising solo, is enormously thirsty when under load. That doesn’t mean the LandCruiser is perfect. Car companies had already worked out how to package third row seats effectively three years before the 200 Series arrived, and still Toyota relied on the old-school method. After six years on the market, the 200 Series is beginning to feel a bit long in the tooth as well, lacking the Nissan’s advanced technologies. But it’s a well-rounded vehicle that also does most things right as a heavy-duty tow tug. 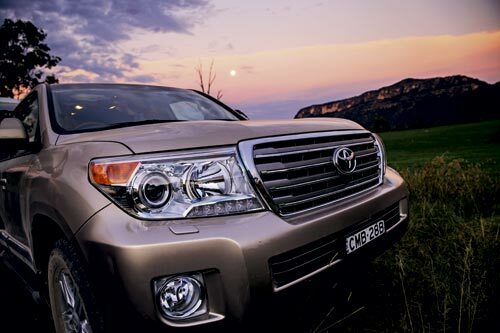 The LandCruiser 200 Series has just proven itself again. 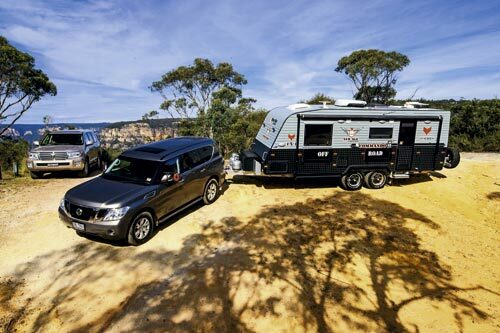 Thanks to Sydney RV Centre, www.sydneyrvgroup.com.au, for the loan of the caravan in this test.